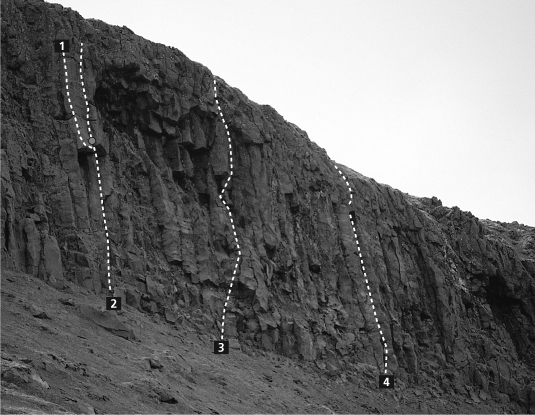 This crag gives both excellent short routes at moderate grades as well as some of the best long routes on the mountain. There is a good weekend’s climbing on Warwick Castle alone. Beyond the blocky ground below Bop Girl, Sun and Fun the cliff again becomes more vertical, but split at about half height by blocky overhangs. The next two routes go through these overhangs. The twin columns forming the roofs of the following two routes are very distinctive. This is the ﬁrst worthwhile route below the broken ground to the right of Fun. It is about 30 minutes walk from Tahurangi Lodge, or about 1 hr up from the Stratford Plateau. To descend either abseil off, or walk along the spine of the ridge towards Lion Rock. 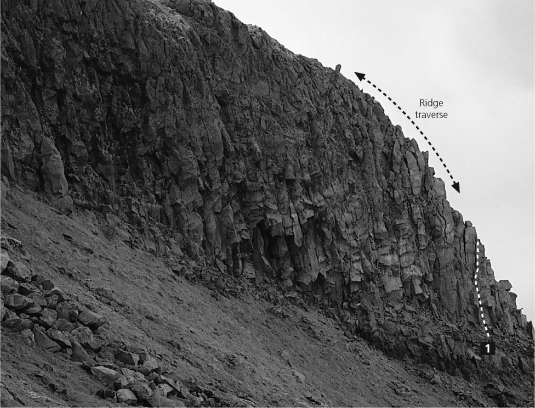 The spine or arête of the ridge is considered a good scramble and not to be underestimated. You may desire the protection of a rope at certain places. This is a more challenging variant of F.M. Start as for F.M. Belay just above overhang. This route then takes the arête about 2m to the left of F.M. Climb arête starting at the very lip of the overhang. Use crack to your left for protection only. A necky route but ﬁne climbing. Lionel Clay, Richard Kirk, 06/03/85. Climb the large crack in the right facing corner to the overhangs. Move slightly left and climb a shallow groove through the overhangs (crux) then out to the top. Kevin Conaglen, Nick Banks, 28/11/81. Located just up from broken area at bottom end of cliff. Climb crack, smearing on tiny nubbins to small, mossy ledge at 25m. Belay from cracks at left and small cams under flake. Climb up and over small roof, undercling, then dyno for high hold. Bridge to finish. A deep vee with a ‘fang’ like spike protruding from the top of the groove. Kevin Conaglen, Dave Bolger, 15/01/00. Big crack at the very bottom end of Warwick Castle. Kevin Conaglen, Nigel Shepherd, 18/04/82.